Ashiq Hussain Sindhi Shehnai Master. He was most popular Sindhi Shehnai Instrumental Master and great Artist of Sindh. He played "Shehnai" Shaadi Music Instrumental in his own style and he sung lot of songs in Shehnai and "Dhol". Sindhi Shehnai "Sherna" Master Ashiq Hussain very popular "Shehnai" player in Sindh, he create good name in Sindh Music. He played Shehnai in marriage ceremonies, temple of Burzrigs in Sindh and other events in Sindh. 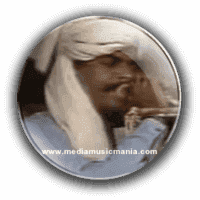 He played Shehnai "Sherna" in India, Pakistan, Bangladesh and Iran. Shehnai Instrumental is popular Saaz, specially used for different music programs and important local ceremonies. This Saaz Sad Shehnai Sindhi Dhun often played on the event of happiness, and other social activities and programs on every day. Shehnai is made out of wood, with a double reed at one end and metal or wooden flared bell at the other. Ashiq Hussian is great Shehnai Player of Sindh, specially Shehnai widely used during marriages, processions and in temples although it is also played in concerts. Ashiq Hussain is very popular Sherna Master of Sindh he is very popular on Radio Pakistan and Pakistan Television and he played Sufi Kalam, Sindhi Folk Music with Shehnai. The great sound of Shehnai is thought to create and maintain a sense of auspiciousness and sanctity. I have selected most popular Music on Shehnai of Ashiq Hussain.